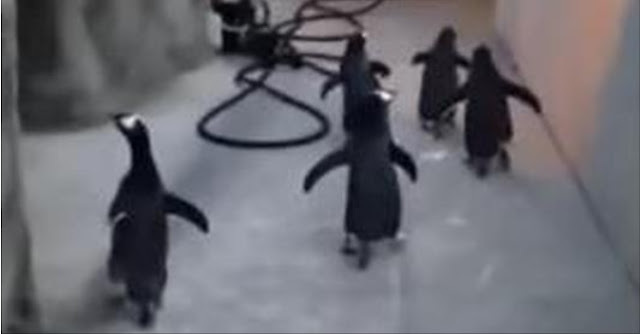 Five plucky little penguins at the Odense Zoo in Denmark were recently caught in the act of trying to make a break for it. Unfortunately, their bid for freedom was thwarted when the birds' keeper was alerted to their escape attempt after spotting their hurried little footprints in the frosty enclosure floor — leading to their discovery in a corridor in the back. In 2012, a penguin managed to slip out of his enclosure at an aquarium in Japan, after which he took up residence in Tokyo Bay. Despite having been born in captivity, the feathered escapee was able to thrive on his own in the world beyond his cage. Responses to "Zoo Penguins Attempt A Daring Zoo Escape"